Liberty Gas Station at 1200 Bristol Pike in Bensalem, Pennsylvania. A man is still buried beneath rubble from the aftermath of an explosion at a Liberty gas station in Bensalem, Bucks County. Police are beginning an investigation into the cause for the explosion, as they wait for heavy machinery to lift off heavy slabs of concrete trapping the remaining man underground. Homes and businesses in the area were evacuated in case of any further blasts, according to township Public Safety Director Fred Harran. 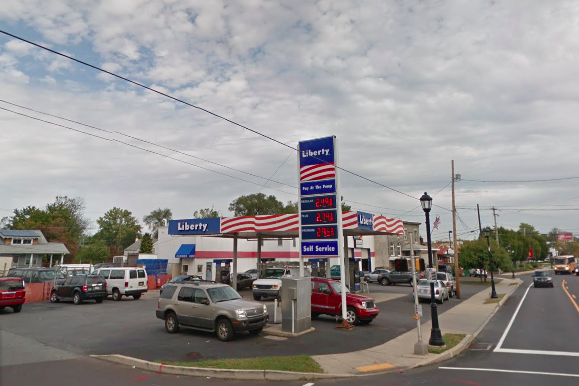 An explosion at a Liberty gas station at 1200 Bristol Pike in Bensalem injured at least two people Tuesday evening. Fire rescue teams are responding to an explosion that happened around 5 p.m., according to NBC10. Officials are working to free one man who was trapped under rubble at the explosion site. Another man was rescued and taken to a nearby hospital in critical condition. NBC10 reported the men were doing underground work on a tank when the explosion occurred. Two firefighters attempted to go into the underground hole, but could not due to gas fumes. Officials are waiting for heavy machinery to remove concrete slabs to rescue the man, NBC10 reported. There is a concern that another explosion could happen, officials said. This is a developing story. Check back here for updates.